A rare original circa 1970 programme photo, clearly signed in ink by all four group members ; Rod Argent / Russ Ballard / Robert Henrit and Jim Rodford d2018. 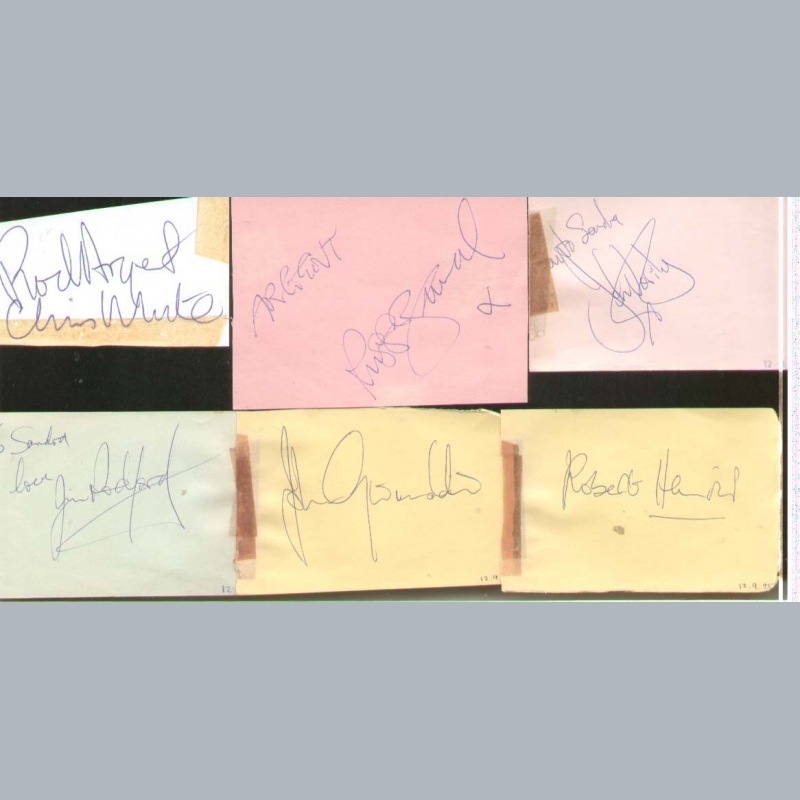 A set of six original (circa 1970-75) autograph book pages, clearly signed in ballpoints by all seven main group members over the years ; Rod Argent (keyboards) X2 / Russ Ballard (left 1974) (adding Argent) / Robert Henrit (drums) / Jim Rodford (bass) (To Sandra love) / John Verity (guitar) (Love to Sandra) / John Grimaldi d1983 (guitar) and Chris White (bass / producer & songwriter ex Zombies). 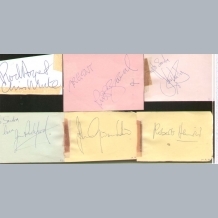 An extremely rare full set of original vintage 1970s autographs including guitarist John Grimaldi who died of MS aged just 28 in 1983. 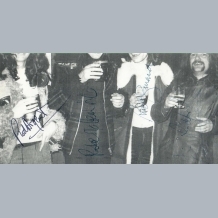 There is a second Rod Argent signature on the reverse of the John Verity page. 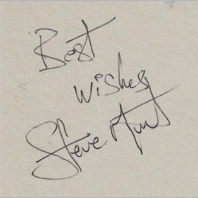 Most pages are from the autograph book of Sandra V containing a few pop music notables collected during the 1970s in the Bristol area (probably The Colston Hall). 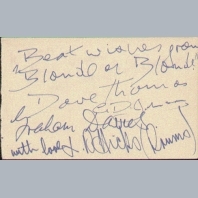 Some are dedicated to her. 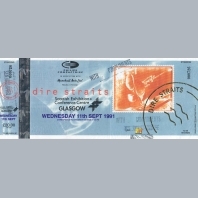 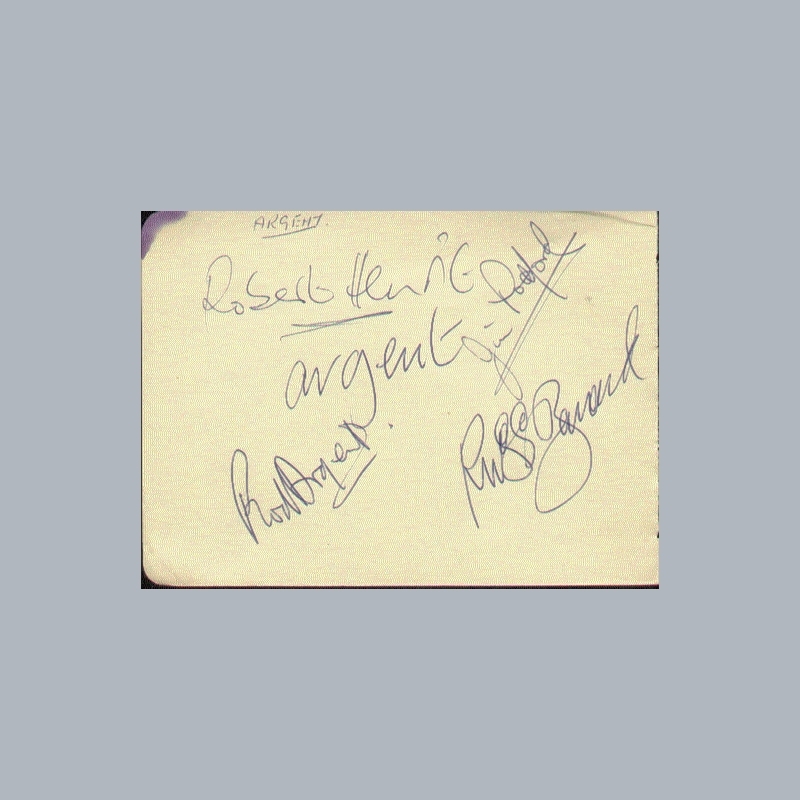 Collectors notation is 12th September 1975. 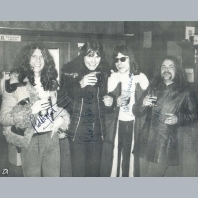 The remaining pages are from autograph books obtained by ourselves over the years. AFTAL Dealer No13 and UACC RD Memorabilia UK COA. 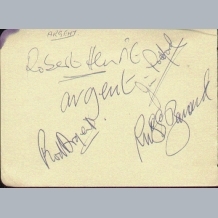 A rare circa 1970 autograph book page clearly signed in ballpoints by all four group members ; Rod Argent / Russ Ballard / Robert Henrit and Jim Rodford.